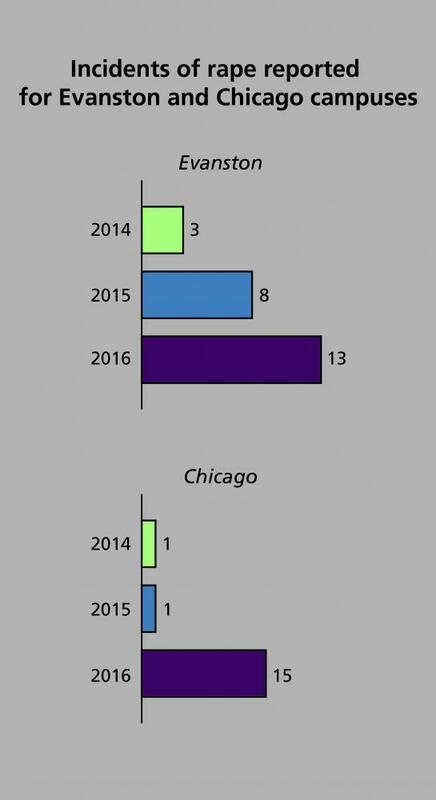 Northwestern’s 2017 Annual Security Report for Evanston and Chicago showed an increase in reported rapes in 2016 compared to the two years prior. The report, sent in a Friday email, includes statistics on crimes reported in 2016, 2015 and 2014 at the Evanston and Chicago campuses. The Clery Act requires colleges and universities to release “timely and annual information” regarding campus crime and security policies, according to the report. Thirteen rapes were reported in 2016 on the Evanston campus, up from eight in 2015 and three in 2014. Reported rapes increased significantly for the Chicago campus: 15 rapes were reported in 2016, while just one was reported in each of the previous two years. Burglary reports also increased from 2015 to 2016 — from 23 to 34 reports in Evanston, and from six to 10 reports in Chicago. The Evanston campus saw a decrease in liquor and drug law violations referred for disciplinary action from 2015 to 2016, according to the report. Liquor law violations decreased from 439 to 272, and drug law violations decreased from 77 to 48. Drug law arrests in Evanston increased from one in 2015 to eight in 2016, while liquor law arrests remained at zero. Data in the report are provided by University Police, Evanston Police Department, Chicago Police Department and other University authorities. The University also provided reports for its campuses in Qatar, San Francisco, Miami and Washington, D.C.